Read our Online Roulette Games Guide and find out how to play roulette. The croupier simply rolls a small white ball in one direction inside a trough which contains a wheel with numbers and slots. The wheel is spun in the opposite direction. Obviously, this can only be done when playing at an actual casino. If you don’t like the digital version, you can still get the nice human feel by playing live roulette where there is a real dealer spinning on webcam! Once the ball has settled in a slot, the winner is decided as per the number or colour slot the ball has settled in. The wheel consists of 18 black and 18 Red slots plus a green slot for zero. The European roulette wheel has 1 green slot for the number 0 where the American based standard roulette Wheel sometimes has an additional 00 green slot. Want to try a Live Dealer Casino for playing Roulette? When playing roulette you have two main sets of bets, the first have been classified as Inside bets as these are directly on the numbers inside the numbered table. 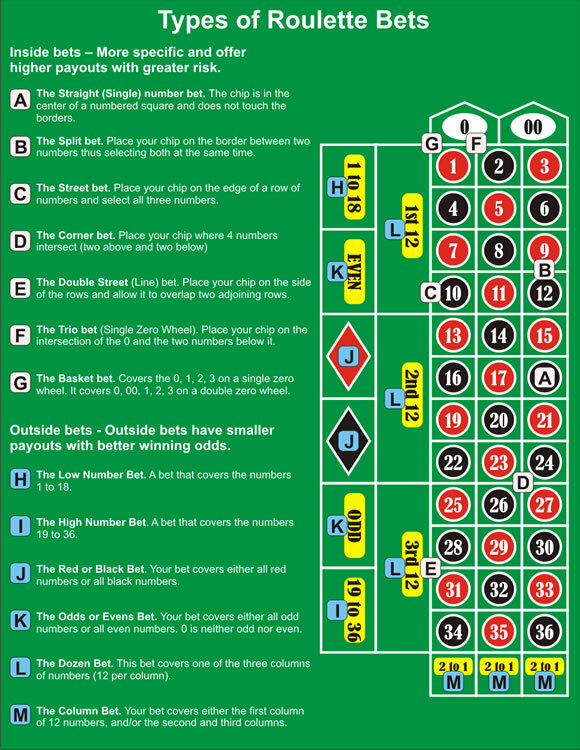 The second set of bets are known as the Outside Bets, these are bets on the area on the outside of the number layout. The European Roulette game, which is played on a wheel that contains only one 0, and has a house edge of 2.70% whilst the standard 0 and 00 American wheel has the house edge of 5.26%. Obviously, it pays to play the European Roulette game. As you can see roulette is largely a game of chance. There is very little you can do to improve your odds of winning, because for the most part, lady luck controls your fate. The game is however built rather strongly around a culture that professes to have systems to beat the Roulette wheel. Let’s face it, the calculator says the casino will win and so it will. If the calculator could be manipulated then the casino would be out of business. Beware the systems, they work on the basis that an event (like red for example) can only come up a certain number of times before black has to come up. That is true but there is no guarantee that it will happen on the next spin of the wheel. The random nature of the games is such that to reach that nirvana of a 50/50 head or tails result in a coin flip one would need the results of hundreds of thousands of coin flips. There will be stages where heads will come up many times in a row or, similarly, tails might suddenly crop up for 10 times in a row or more. The Roulette system is built on the premise that your turn MUST come but sadly, this is not only false but likely to cause you great losses….. Avoid the systems, enjoy the glitz. Roulette is a posh game where high rollers abound. It’s a fun game for both ladies and gentlemen. It’s a casino game through and through.